Wild: The fact that this creature exists is enough to give me nightmares. Like the island’s other Arthropods, Arthropluera Felsanguis has become much larger than I might have believed possible. It’s a very aggressive hunter, but prefers to eat meat after it has rotted for some time, and will voraciously seek out such delicacies. Domesticated: Like most of the arthropods on the island, Arthropleura is simple minded and relatively easy to tame. It is an almost entirely military mount, useful mostly for attacking at a distance. 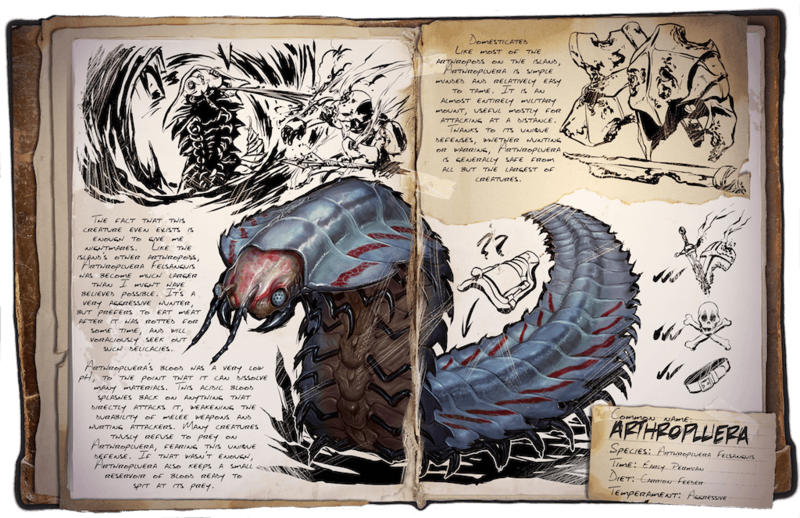 Thanks to its unique defenses, whether hunting or warring, Arthropleura is generally safe from all but the largest of creatures. Known Information: Arthropleura’s blood has a very low pH, to the point that it can dissolve many materials. This acidic blood splashes back on anything that directly attacks it, weakening the durability of weapons and hurting attackers. Many creatures thusly refuse to prey on Arthropleura, fearing this unique defense. If that wasn’t enough, Arthropleura also keeps a small reservoir of blood ready to spit at its prey.